Yesterday, Abdul Razak Ali Artan, a Somali-born refugee attending Ohio State University decided to go on an Isis inspired rampage and injured eleven people before being killed by an on campus police officer. Artan started out his attack by plowing his car through a crowd of people outside of an engineering classroom. He then exited his car and started attacking people with a butcher knife… notice how no gun was used by Artan? That’s not how the gunDense left saw things go down. As tragedy struck, Shannon Watts, Tim Kaine, and many left leaning media sites all declared this a “school shooting” or a “mass shooting” and wasted no time in beginning to politicise this event. This was in no way whatsoever a mass shooting, or a school shooting, it was not a shooting at all, it was a terrorist attack done in the style of other Isis led attacks. Moms Demand Action front runner, Shannon Watts decided she was going to go on a little tweeting spree about how there was an “active shooter” on the OSU campus. Before waiting for all of the facts to come out, Watts automatically screamed gun violence. She tweeted “Other nations protect their students. America gives dangerous people guns and asks students to defend themselves. Ohio State University”. Okay, let’s dissect this tweet. First of all Shannon Watts acts as if America plucked Artan out of a group and handed him a gun no questions asked. For a smart person, they would be able to tell you that this is far from the truth. Gun laws do not help the law abiding, they help criminals. Since when has a criminal ever obeyed a law? Right, they haven’t. Now the part about asking students to defend themselves… well you see, that would be solved simply by allowing campus carry. If a law abiding citizen on campus had a gun on their person, less injuries are likely to happen. Being as how OSU is a gun free zone, well that just proves the point that criminals do not listen to laws, hence the word criminal. Watts’, an hour later thought she should grace us all with her gunDense word vomit once again tweeting “For school shooting victims it’s not too soon to discuss our nation’s lax gun laws – it’s too late. 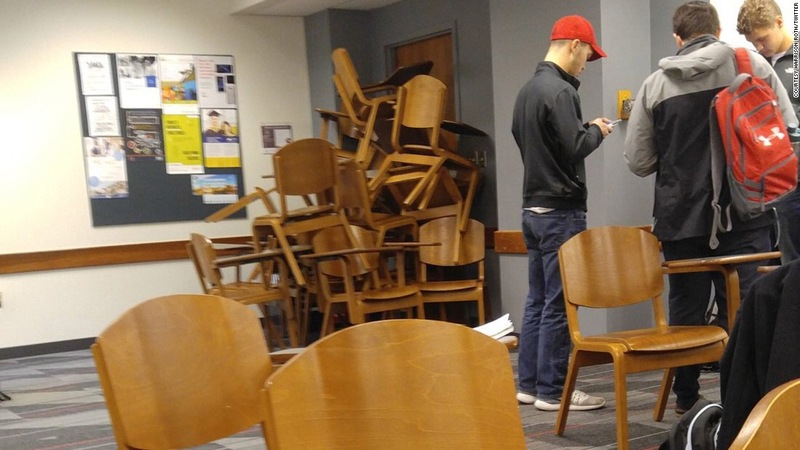 Ohio State University” she then attached a picture of a group of students on campus inside a room barricaded with chairs. That entire tweet is one giant paradox. “Not too soon to discuss…lax gun laws.”?? What. How on earth is it the fault of America, and the law abiding that a criminal obtained a gun? She acts as though Artan was a law abiding citizen who was legally carrying a firearm. However, quite the contrary, he was obviously not a law abiding citizen considering most people do not wake up and decide to ram a car into a group of people, then get out and start stabbing them. Again, he was not legally carrying a firearm. There wasn’t even a gun anywhere in this instance other than the gun used to shoot Artan!! How Watts and other leftist gunDense people even managed to bring firearms into question, I’m not sure. Former vice presidential nominee, Tim Kaine thought we could all use his two cents as well. (We didn’t) He said “deeply saddened by the senseless act of gun violence at Ohio State this morning. Praying for the injured and the entire Buckeye community” This is once again a rather brow furrowing tweet being as how there was no “gun violence”. Unless the officer who shot and killed the terrorist was an example of ‘gun violence’, most people would disagree with Kaine’s sentence. Sidenote- I would link Shannon Watts’ tweets, however she has me blocked on Twitter, therefore I see her tweets by way of someone else’s Twitter. Our thoughts and prayers are with the victims of the OSU stabbing.